If you want to play in Facebook Sandbox, then you need to follow their rules or you and all your accounts will be banned almost immediately. Allowing businesses to communicate to our clients direct via messenger, works as long as it is not abused. 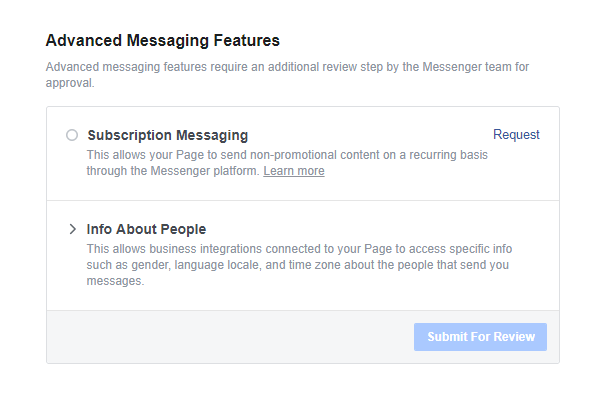 In order to do so, Facebook has created rules on how often you can message a client refereed to as the 24 Hour + 1 Rule. 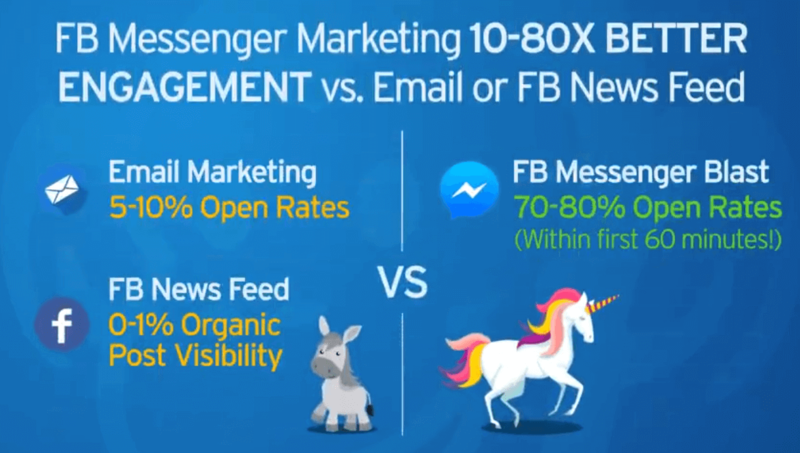 Today we are going to take you through the 3 different types of Facebook Messenger including Standard Messaging, Subscription Messaging (Beta), and Sponsored Messaging. To begin a conversation with a customer in messenger, it first must be initiated by the customer at one of the following methods. 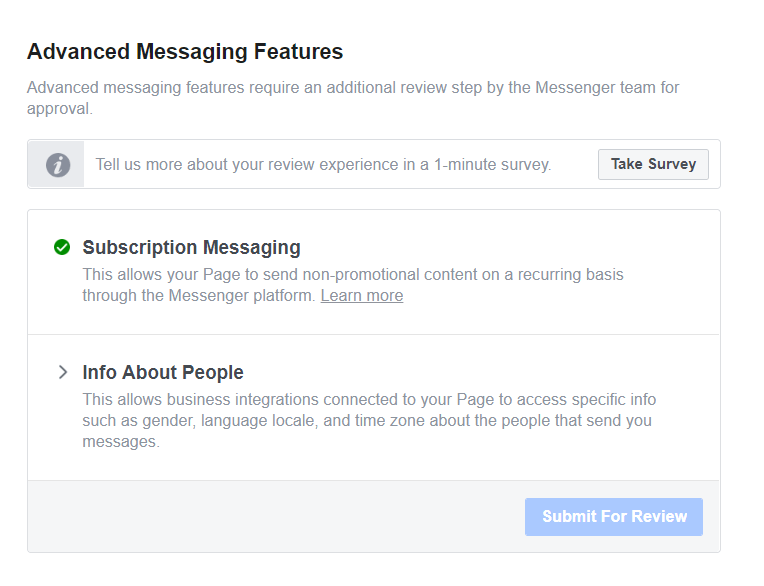 Once the conversation is started, then the messaging policy applies based on how your messaged and status within Facebook. 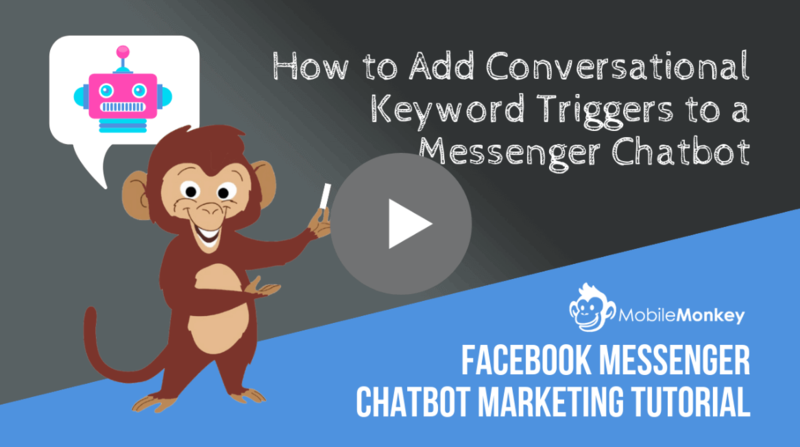 This includes a person sending the business message direct through their fan page, clicking on a Send To Messenger Button, a customer initiating a conversation via a plugin such as a chat support. 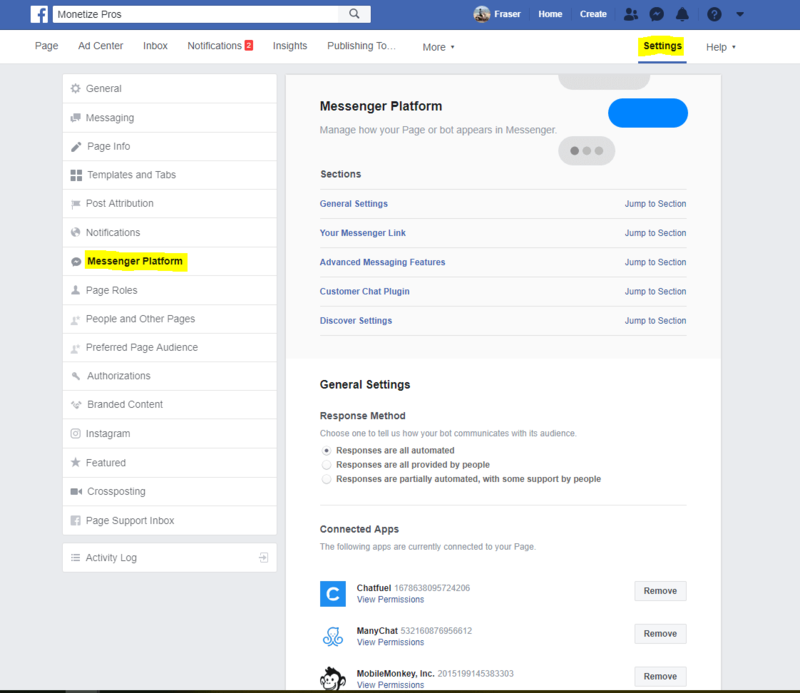 Once a customer has responded or initiated to a message in messenger, then the business has up to 24 hours to respond to the messages as commonly listed in the 24 + 1 policy. Once this time limit has been reached, then the bot may send up to 1 (non promotional) message after the 24 hour time limit has been expired. During this 24 hour rule, You are allowed to send unlimited promotional constant in these standard message. However, you do not want to overdue it. The bonus (+1) message can not be promotional in nature, but once the customer interacts with the bot the 24 hour resets and you are allowed to send more promotional items for up to 24 hours. Customers using the Chatblasts (or broadcast) feature need to be careful unless they are approved for sponsored messaging. These messaging platforms normally allow you to schedule, without getting approval, so do your own research and due diligence or may suffer a banned account or red screen of death!! All businesses should take the time to apply for sponsored messaging and keep applying to accepted. It is harder for eCommerce brands and marketing companies, but is doable. 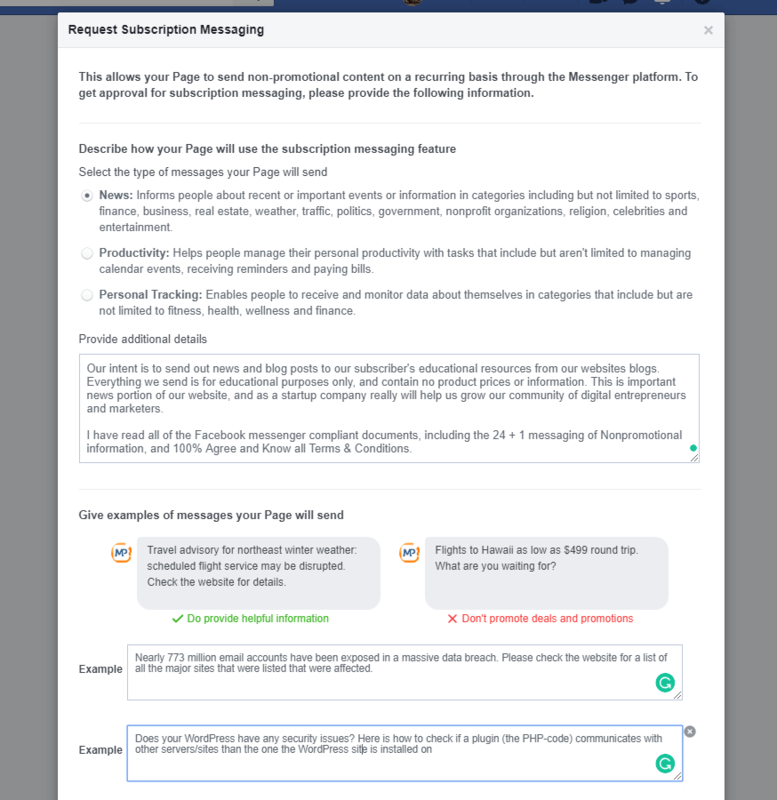 The same rules apply for sponsored messaging as the standard (24+ 1 Rule), but after the followups, you can send unlimited educational (no promotional) messages until the customers interacts with the bots. This is when the 24 + 1 Hour rule comes into affect again. As I mentioned above, it is difficult but achievable for brands to achieve this. While applying I have NEVER been accepted on my first try, so keep applying. Start by navigating to your fanpage and clicking on Settings in the top right. From here you will click Messenger Platform on the left side, then scroll down. 2. Select on Request for Subscription Messaging Under Advanced Messaging Features. 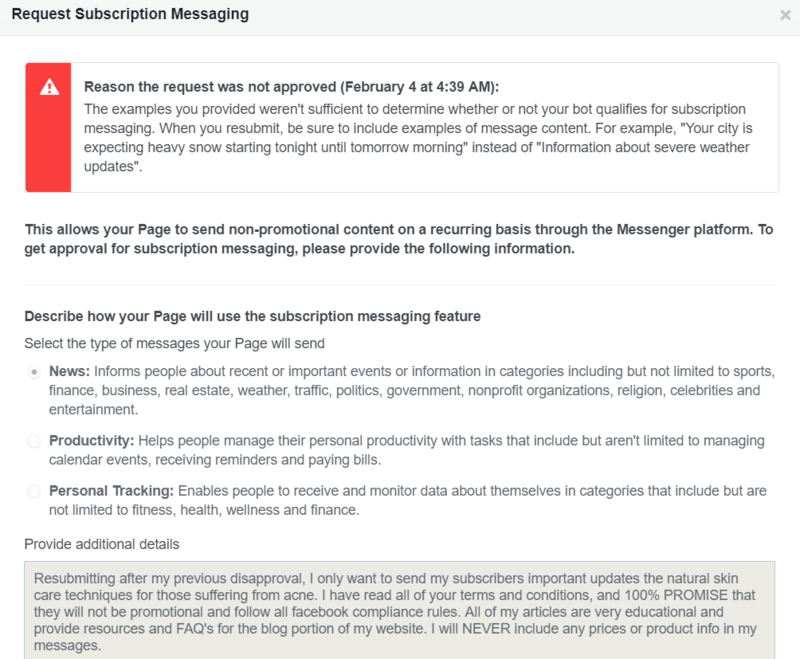 Once you click on this page, you are going to need to apply for how you will use your subscription messaging features. B. Provide Additional Details - Here is the exact message I used to get accepted. Remember someone is sitting on the other end of the screen, so you need to make sure that you read all the terms and conditions. This includes stating it is educational, non promotional, and include no pricing. C. For the examples, how is your content news worthy? What are you going to send out. One of my messages on blogs was how many websites passwords were compromised and new info on seeing if your plugin has been hacked. Please see below for my examples. 4. If not accepted TRY TRY AGAIN! I have never had an account accepted on the first try, if you are not accepted keep trying. Make more of an emotional request to the person who reviews this. Remember, this is a person reading this, and the more info you can give on why you will follow the terms and of service the greater the chance of being accepted. For those that have not received Subscription Messaging Status, there is still hope 🙂 Unfortunately it is going to cost you. Sponsored messaging is designed for a form of paid advertising that allows businesses to engage with customers after the 24 hour rule of the standard messaging rule. This allows you to send both promotional or educational content to the users afterwards if you have not been blocked. Even though you are paying for this service, it is highly effective and provides one of the highest ROI as the customer is already aware and will most likely engage iwth your message. Facebook rules and regulations are always going to change, so it is important to stay on top of all the regulations to make sure that you are remaining compliant. Fore more information on chatbots please see our other articles on How To Build A Chatbot and The Best Messenger Software Programs. If you have any troubles getting approved, or any questions, please make sure to comment below and I will make sure to respond to every questions. Hi Cathy! Great question 🙂 After the 24 hours according to Facebook Messaging policies it needs to be informal or news related. I would suggest first asking them if they want to see your newest blog post first, and if they engage the 24 hour restarts and you can send them as many promotional messages as you want for the next 24 hours. Hope it helps! Great info! Am I allowed to include a button in a subscription message that takes them to my website or a flow or is that promotional?